There is no denying that the Lexus RX ranks high in the luxury category, and for a reason. It’s affordable – in luxury speak – it delivers just the right ride quality luxury buyers are looking for and it pushes the edge in exterior design, not to mention Toyota reliability and dealership appreciation of buyer and owner. 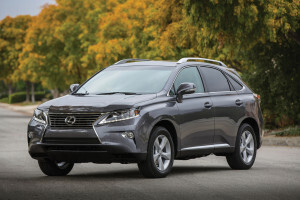 The 2015 Lexus RX 350 integrates the polarizing spindle grille that now graces all Lexus.’ On the other hand, the sculpting of sheet metal excites the senses with a meaty rear quarter panel that draws attention to its road-worthy stance. The interior envelopes those that love the smell of leather and a little something different in center stack design. As with the first RX back in 1998, Lexus provides a place for the driver’s purse under the console. Despite an extra-quite interior, a Mark Levinson sound system keeps 18-wheeler roars to a minimum. Power comes from a 3.5-liter V-6 that delivers 270 horsepower and gets 18 MPG-city and 25-highway. The standard front wheel drive is adequate for most bay residents but all-wheel drive is also available. Underscore “family” SUV when it comes to the Mazda CX-9. This full-size SUV offers plenty of Mazda chutzpa – Zoom Zoom – with lots of power and sports car-like handling. The new face of Mazda appears in a recently reinvented grille and while this vehicle is basically a 7-year old design, it’s still relevant and competitive with most of its rivals. The CX-9 is available in three trim levels, Sport, Touring and Grand Touring, the later two with upgrades to the sport or additional options packaged with the most popular configurations. Where this big boy really shines is its interior room. So many manufacturers tout 3-rows of seating, yet, in most cases, the third row is impossible to get to, unless you’re under the age of 16. For those that make it, they’ll find legroom non-existent. This is not the case with the Mazda and to us, this is a huge plus. Under the hood is a responsive 3.7-liter V-6 with 273-horsepower that gets 17-city and 24-highway. The six speed transmission works flawlessly but if you’re not careful, you’ll squeal those front tires squirting across traffic from a stop. The 2015 Mazda CX-9 begins at $29,985.